Save money and help keep the planet cleaner with this shed. The Absco Eco Sheds are one of the ‘cleanest’ and affordable storage choices on the market. They are made from eco-friendly, chromium-free steel and supplied in 100% recycled packaging. You will not only save money but will help keep the world cleaner. 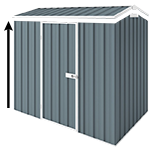 This 1.52m x 0.78m x 1.95m Zinc Eco-Sheds the smallest in the range but has all the great qualities of a typical Absco shed. It can store all your gardening equipment and outdoor accessor s, so that your backyard will stay neat and tidy. Sheds are packed and delivered with all parts and instructions included.